While studying the nighttime sky, the question my preschoolers ask more than any other: where do the stars go during the day? 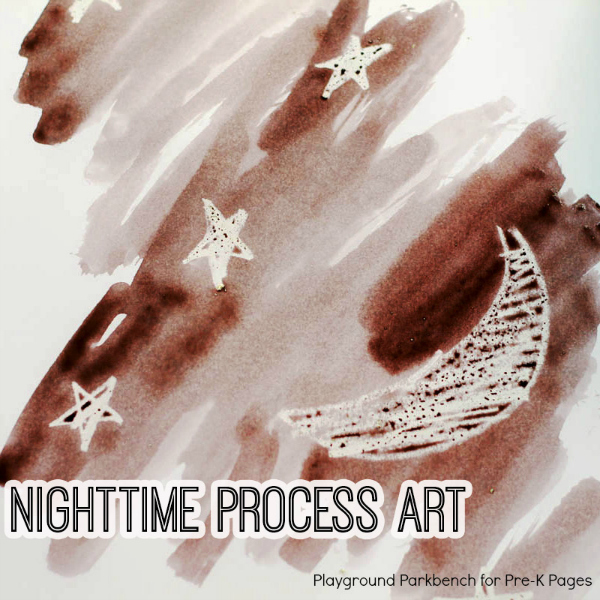 This simple nighttime process art activity not only allows them to freely explore their creativity, it helps them think about this science question, too. 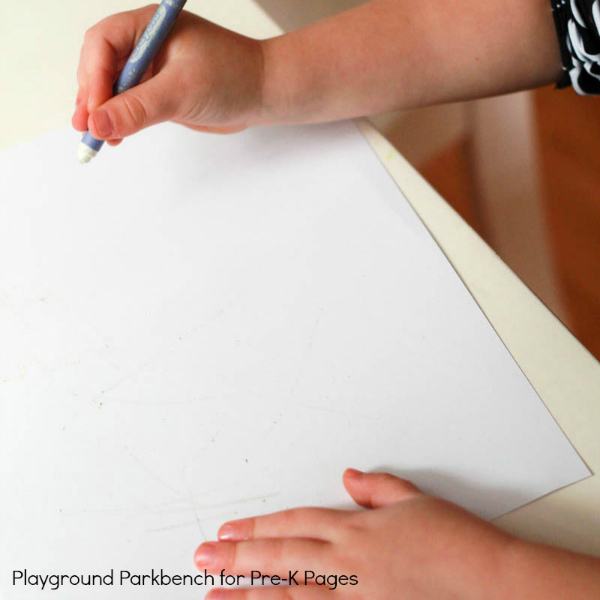 Process art is ideal for preschoolers. It emphasizes the process of creating itself, exploring the materials, and how to manipulate them, rather than any end product. For preschoolers, still mastering proper pencil grip, process art is an awesome way to let them naturally work on those fine motor skills necessary for creating and to introduce them to various artistic media without any pressure to mimic a specific result. For this activity, students will work on proper pencil grip, both using crayons and holding paintbrushes. 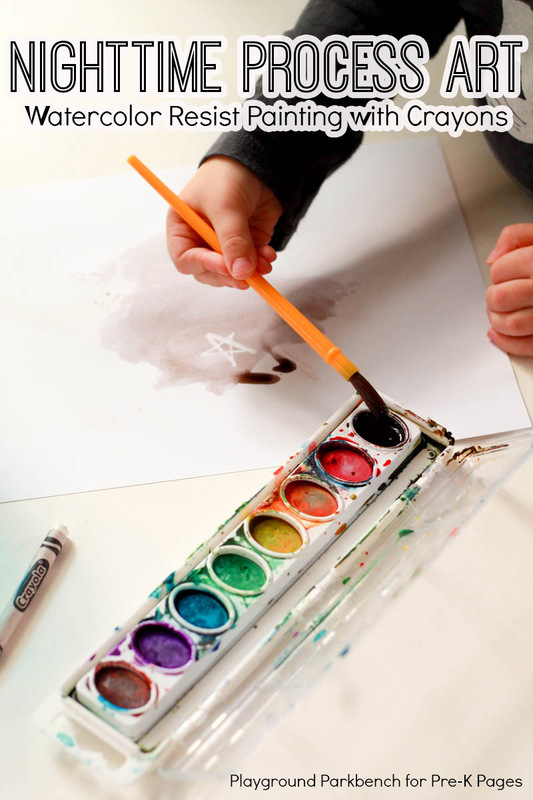 They will also learn how to use watercolors–dipping the brush in water, then paint, then applying it to paper–which may be a new experience for many early learners. Resist art uses two media that don’t readily mix to create layers of either color or texture. We have all created resist art at some point in our lives – whether it’s drawing on hardboiled eggs with crayons at Easter before dyeing them or painting over tape on a canvas to create a specific design. Both of these methods can easily be used with preschoolers. To make a Nighttime Sky, use a white crayon to draw stars and a moon on cardstock. Then, invite your preschoolers to paint over the cardstock with black watercolor to reveal the nighttime sky. I use cardstock because the paper is heavier and holds up better to the liberal watercolor painting of preschoolers! The end result of resist art is always beautiful – and the stark contrast of black and white in the nighttime sky is no exception. Resist art with crayons, especially white ones, also creates an element of magic for preschoolers, much like the disappearance of stars during the day. Explain to your students as they paint to reveal the stars, that just like in our sky, the stars are always there. During the day, the bright light from the sun is so much brighter than the stars we see at night, that we don’t see them. But when the sun goes down, the darkness of night allows them to shine through. BIO: Meghan is a former hedge fund professional turned SAHM to Big M (4), Lil’ M (3), and Baby M (11 months). She writes at Playground Parkbench, where she shares practical parenting tips, STEM activities for preschoolers and family financial savvy. If you enjoyed this post, check out her complete Studying the Stars series, featuring books, sensory play and science activities for preschool. You can also find her on Facebook, Pinterest and Instagram. Follow my Outer Space Theme Pinterest Board for more great ideas!